This TTT isn't for everyone...but you could maybe configure it to fit your life in some way. There is also a bonus idea at the end that everyone can use!! This is Annie...our 10 year old yellow lab. She is a sweetheart and we love her to pieces. I asked her to wave to all my blogging friends! going all the way up there. This picture is literally the last time Annie will be on the stairs. She is getting old and has fallen down the full flight twice. Once was in the middle of the night. You can't imagine what that sounded like. We've been lucky and she wasn't hurt, but we're not taking any more chances. She is taking each step as slowly as possible is this picture. Because of that, I made this. Gates you buy in the store aren't long enough, they are too high, not cute, cost too much...I could go on and on!! This gate just rests between the spindles of the stairs. We slide it back and forth to get through, but it's short enough to just step over. It's even shorter now since I took this picture, because it seems we have a cat that will scale the wall about 5 feet if you are playing with her with one of her toys, but she won't hop over this. Go figure...that's a cat for you. I know...this is pitiful, but I sewed her a brand new big bed for the family room and she loves it. We do miss her sleeping in our room, but sorry Annie...no more stairs for you. Remember the post for the design wall I made with PVC, well same thing. 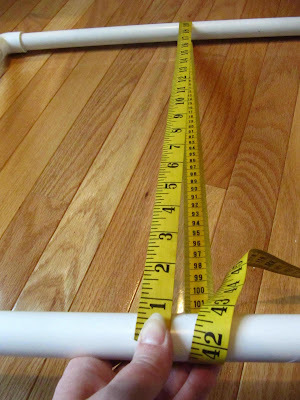 Just measure the width and height that you need, cut the PVC pipe with a saw and add the corner pieces. All can be found in your plumbing section at the hardware store. Ignore that little piece in the middle of one of the long pipes. I just used what I had and that was from another project. You don't need that piece. You just need 4 corner pieces, 2 short side and 2 long sides. Just tap all the parts together to form the frame. Now to cover it with fabric so it's pretty!! Measure the height all the way around with a tape measure. 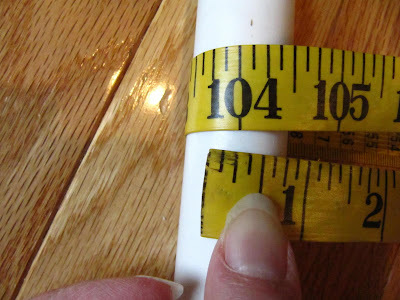 This will ensure you get the thickness of your pipe. 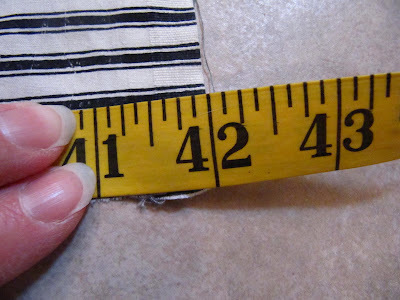 My measurement was 41.5 and I added 1/2" for a seam allowance. 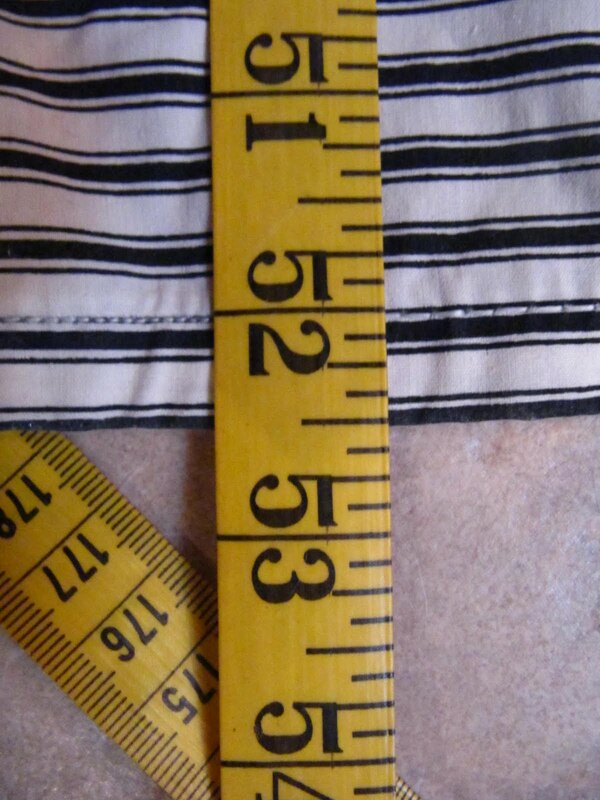 I cut the fabric 42" in one big piece, because I folded it over instead on cutting 2 separate pieces. You'll see in a second what I mean. 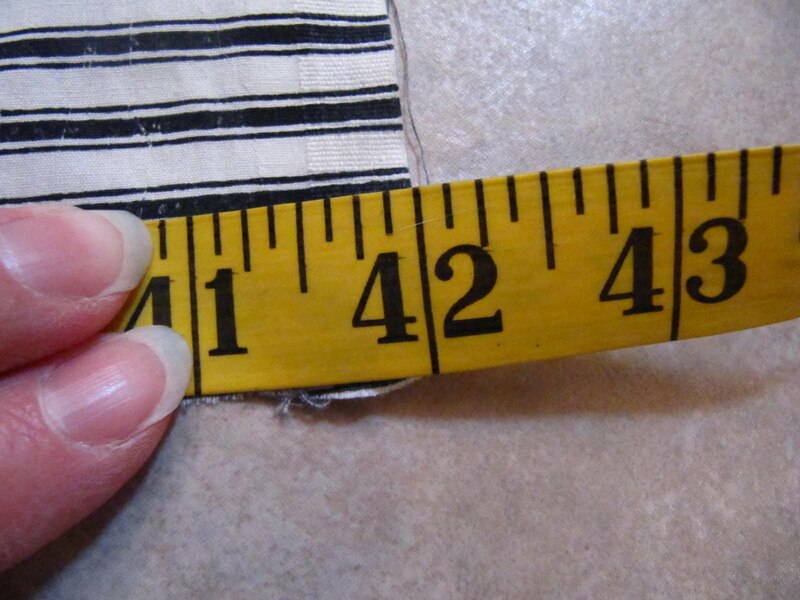 Now measure the width all the way around and add 1/2" for seam allowance. 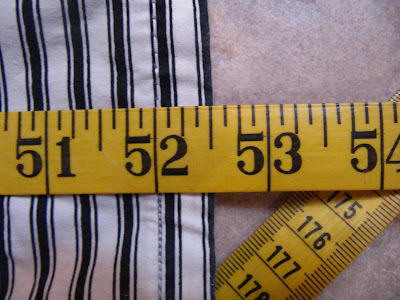 I'm calling that 103.5" plus 1/2" for seam... is 104"
Divide the width by 2, which should be 52...not sure why I took a picture of 52.5"
Here's the pieces of fabric that I have folded over (fold at the top) so it measures 21" x 52" (this is just for my measurement though) With right side together, just sew the short sides with a 1/4" seam. Now it's just like a big slip cover or pillow case. Slide the bottom opening over the PVC frame. 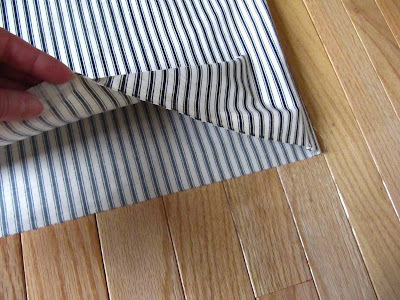 You could whip stitch the bottom closed, but I just left it open. and here you have it...a pretty safety gate for Annie. 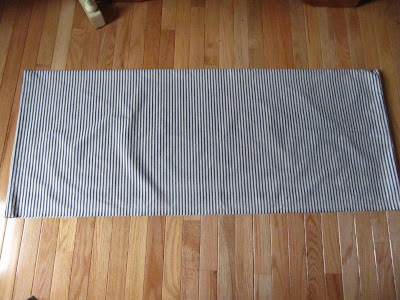 However, you could use this anywhere for dogs, babies, toddlers. 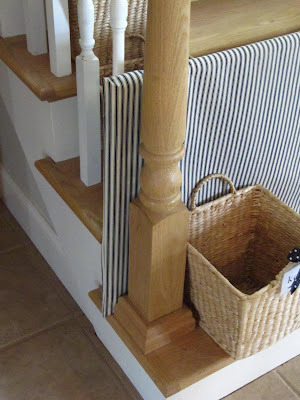 If you don't have spindles to rest it between, you could always tie a ribbon around the PVC and then attach it to the stairs or doorway or wherever you need it. It can keep things in or out. The great thing about this gate is it's cheap, you can make it to any size you need, you can match it to your room and it's cute too. Here's the gate with the baskets that I always keep on the stairs. I did a post on these baskets a long time ago, but I'll mention them again. These are my "Crap Baskets"...yes "Crap". If I see or collect any one's crap throughout the house, it goes in that person's basket. When they are on their way upstairs, they need to either take their crap or just take the whole basket full of crap with them. I purchased these baskets a while ago at Walmart. What's usually in these baskets, you name it...hair elastics, jewelry, hair brushes, socks, shoes, makeup, books, magazines, games, receipts, clothes, cell phone chargers. Oh my gosh, I could go on, but you know what crap is. I used the clear name badge holders you can buy in the office supply section for $1.88 for 12. I just tied it to the basket and slip their name into it. Hey, that was a Two For Tool Time Tuesday...a gate and the baskets. Hope you like it. Aww poor Annie. She looks pretty apprehensive on those stairs. I need some of those crap baskets. I can't believe the amount of crap that collects in the living room. Oh I just want to hug Annie! What a great idea. I may do something similar to keep our dogs / cat out of our bedroom during the summer when we need to leave the door open for air flow. Love the crap baskets, what a fantastic idea! 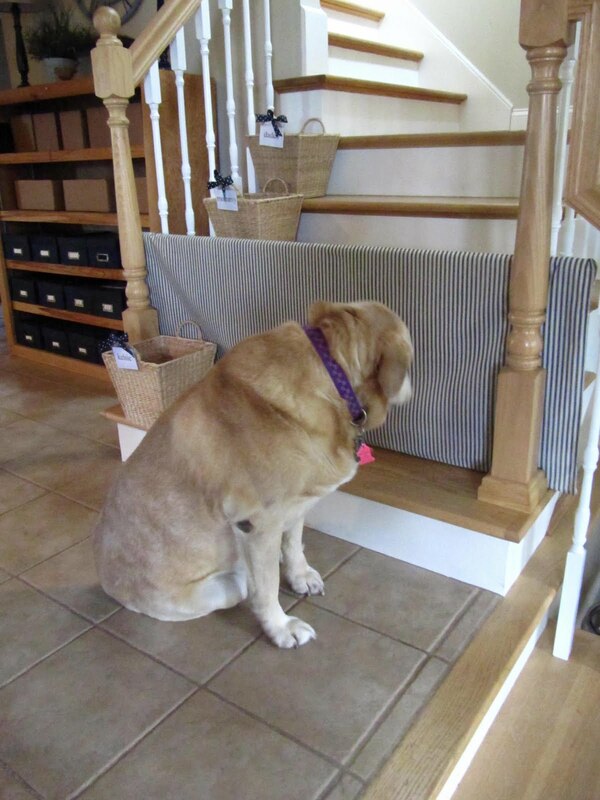 Awww... poor Annie looks so sad... but a very clever way to keep her safe. Love your "crap" baskets too... great idea! Oh, Annie is a lovely old gal. 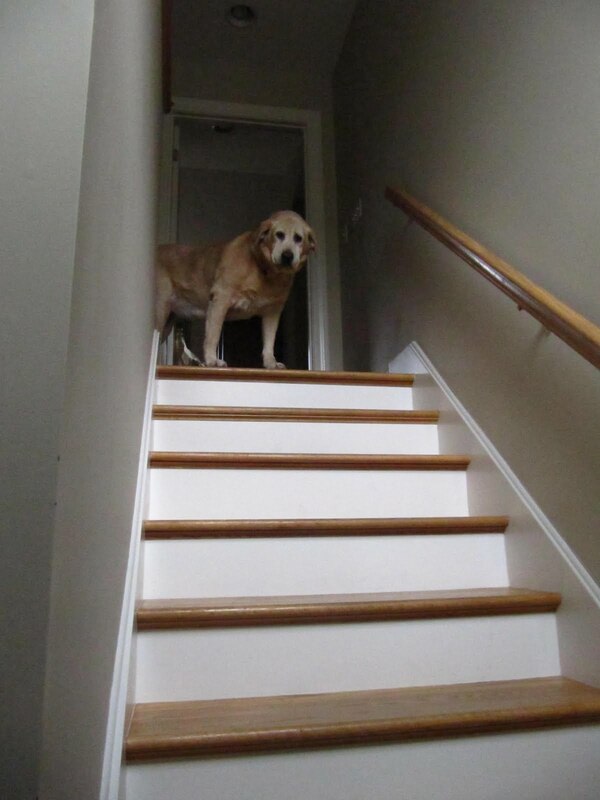 A great idea to keep her safe, stairs are always a worry with an ageing dog. I know - we have an older dog, Dash, our border collie is 11 now and getting a bit doddery in the back legs. The 'crap' baskets are great, could use one here for our son to take up to his room in the loft. Annie has a very clever "Mom"! You have my brain churning. My grandson certainly isn't ready to head for the steps but something other than an ugly baby gate would be nice. Unfortunately, I don't have spindles on my stairs - just drywall enclosed on either side. 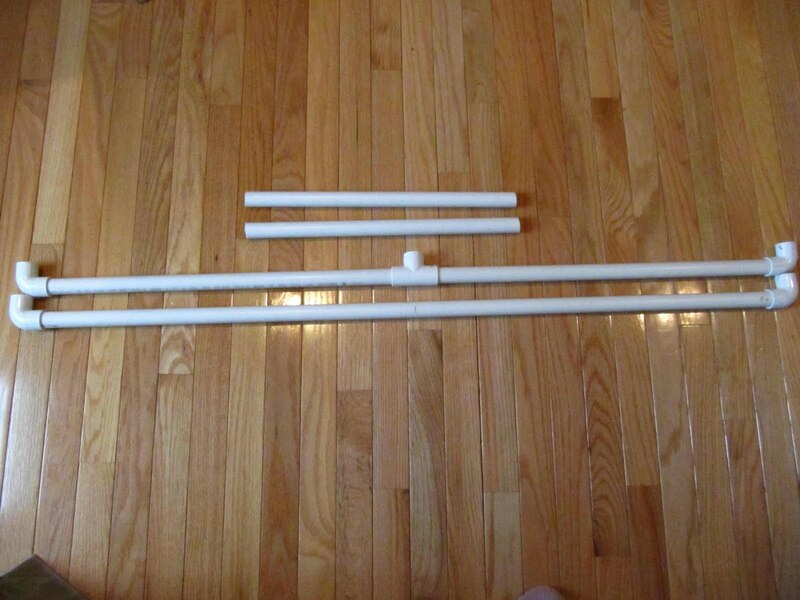 Now I am challenged with figuring out how to make something with tension rods! great idea, I love those crap baskets!!!! very clever! ok, so whose basket has the most stuff in?????? of course I just have to know! 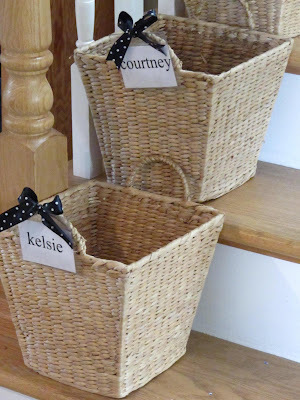 I am going to have to do this too its such a great idea, love those baskets too! what a great gate idea. We just took our down as coco has run of the place. On the stairs I just installed individual braided runners because she was slipping and I was afraid she fall. Thanks for the basket idea, I usually just pile the crap, but this is much neater and better looking. What a clever and so cute of an idea! What a perfect idea! I need something like this for my stairs too. 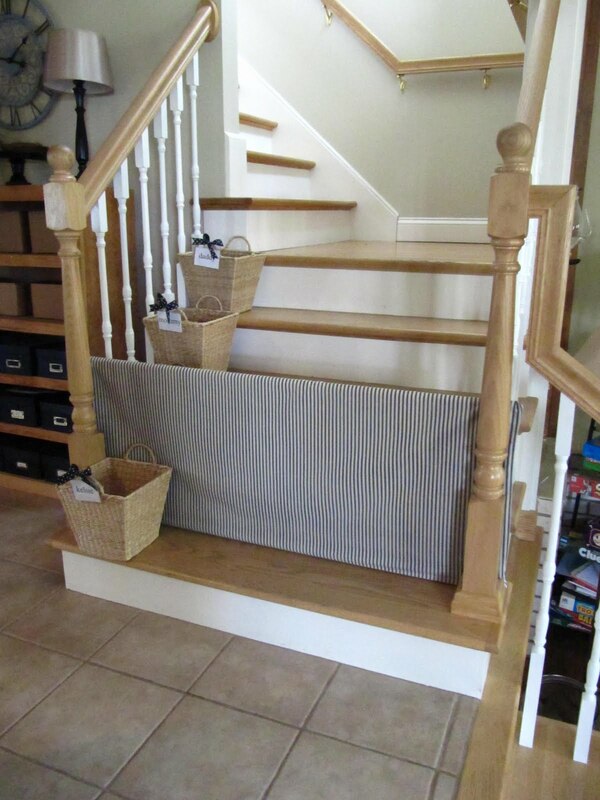 I've been looking for something for my stairs since a traditional gate won't work to keep my 15 month old granddaughter from venturing up the stairs. I don't want to see her fall, and she's starting to move too fast to keep up with. Karen that was a wise thing to do. I have a plastic childs gate on my stairs, but I like yours better. Thanks for the ttt. Our Bishon fell down out stairs as well when she got old. I know that feeling. What a beautiful dog Annie is. She melts my heart. What a great idea! Whenever we have needed a gate it was always for an old size area. Plus, they can be expensive sometimes. If you have toddlers you could cover it with felt. Then make some felt pieces and the kids could make different scenes on the gate. Use numbers, letters or different pieces for the holidays. Another fabulous idea! Isn't pvc just the best? Your dog is just darling, and so sad looking at the gate :( Love the crap baskets! So decorative and organized! What a lovely old girl Annie is - so great that she has a loving family that takes care of her. Isn't it interesting how we adjust our lives around our pets' needs? 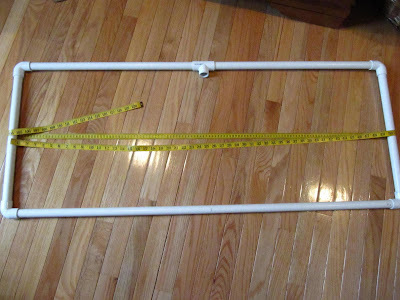 I have a friend who's had to make similar gates for her puppy, a little tiny poodle/shitzu cross who can easily get between the spindles. if I had ideas like yours.LOL..
Love your doggie,he's so cute. I'm catching up on blog hoppin'. Great TTT, as usual! Great solution for your dog. I am thinking this might also work for a child. Might give it a try. Thanks. Love both of these ideas! How big is too big for a crap basket???? I'm thinking as wide as the stairs might be enough for my kids. LOL Thanks for showcasing Annie... does she realize she's famous now? What a great idea. I like to keep my dogs contained when guests come over but I hate to put them in the bedroom - they cry and bark! I've been using a piece of peg board but it's so ugly. Your idea over sewing a slipcover is very clever. I'm going to add that to my "project to do" list. By the way, do you have a tutorial for the dog bed? I sure could use a couple of those, but I haven't liked any that I've seen at the stores. Thanks, and keep it up with all the great ideas! I know exactly how you feel. When my Bonnie Girl fell down the steps, she was given liquid joint vitamins, MSM with glucosamine and chondroitin for joints, and buffered aspirin when in serious pain. Liverwurst is also great for hiding pills in. Awww sweet Annie...we do love our pets!! Great TTT, as usual. 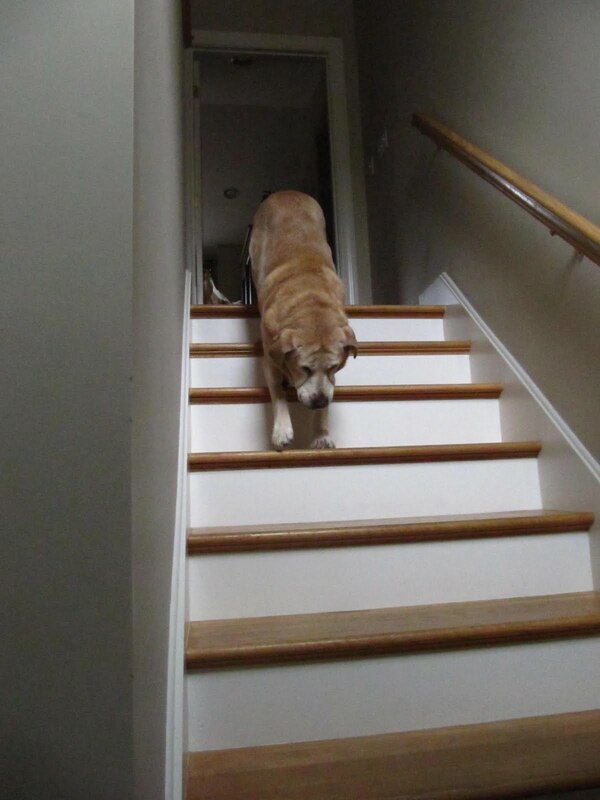 I'm sorry that your gorgeous lab can not scale the stairs, but bless her heart (and yours) that she loves her new bed! Gotta love the personalized crap baskets, too! Karen I discovered your blog and I have to tell you I love things that haces.Tienes very talented and very good taste. I love your studio. went thru the same thing with our girl Cheree, 13 y.o. golden retriever. It is a killer when you block them out for their own good, but it had to be. Sadly, we lost her at the great age of 14 but we think she haunts the house cause we have a pair of cocker spaniels now and one of them is Cheree's clone! It is so fun to watch him and we both laugh and say 'Cheree is in his ear'! Annie is beautiful, old dogs are the best dogs. There's actually a book with that title, grab a box of tissues and check it out sometime. 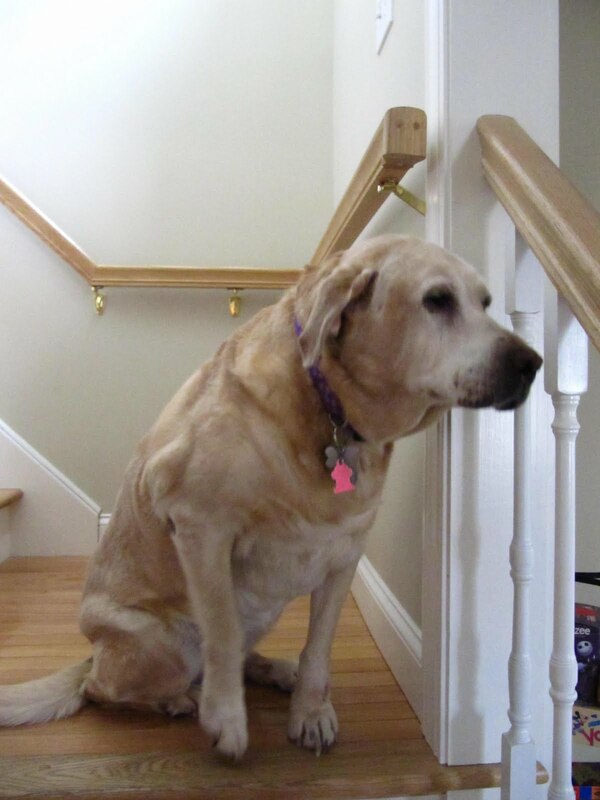 I've lost my lab, but oh, how she was loved. I can so relate to this, and your photos brought back such memoreies - especially the sad little one where poor Annie is looking so mournfully at your barrier to her freedom. Exactly the way mine would look. Give her a hug for me, won't you? Your dog is so cute! What a great idea. I love that gate. And that baskets are awesome! I have one, but everyone's junk gets thrown in it and noone wants to clean it out - lol. 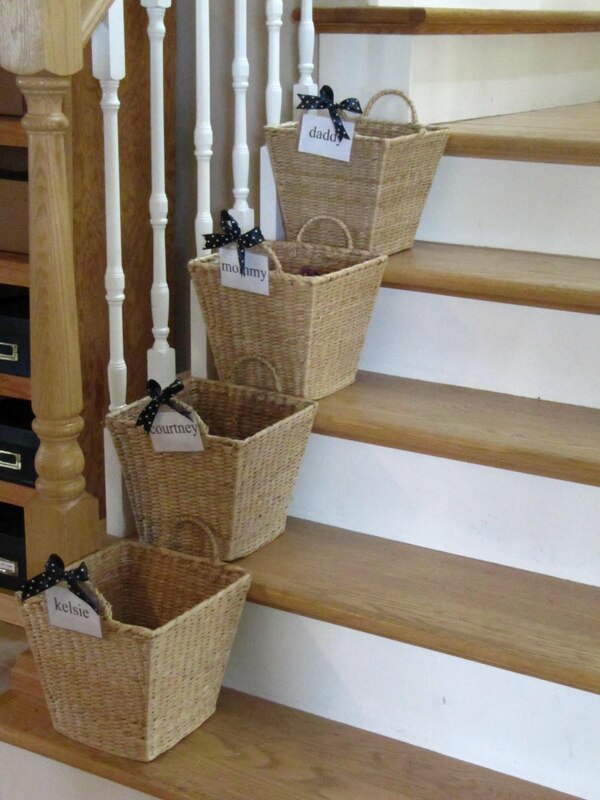 I think I would be retrieving the baskets from the bedrooms all the time! Awww, your dog is so cute! I love the baskets and the tags. I'm having an organizing link party right now. I would love it if you'd come join. There's a giveaway also. Hope to see you there. What a sweet dog. I bet this will be good for her too, no more temptation to go upstairs, which means no more falling down. 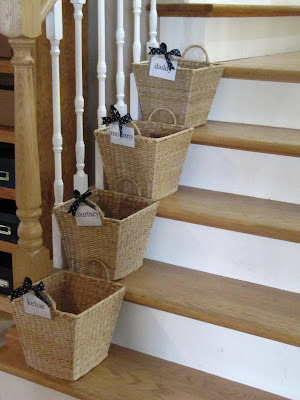 I love the baskets on the steps. What a great idea! 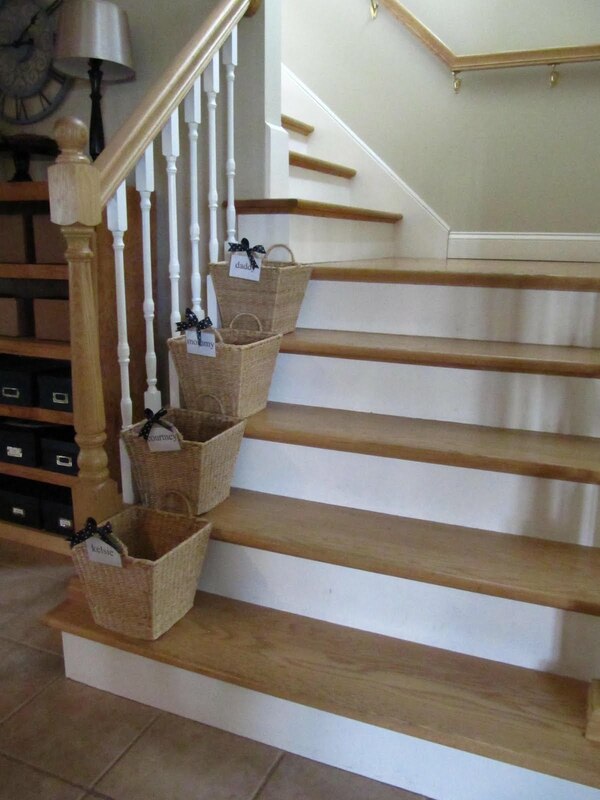 I usually just throw a pile of stuff on the stairs and add to it throughout the day, baskets would look much better. The baskets are an awesome idea. I love the basket idea! I can see needing those when my kids get older. For now, I'll probably make one for myself (I have a lot of crap)! Love the gate! Looks so much better than a baby gate, that is what I use. Oh Karen, I love Annie's kind face. I so relate to this situation. 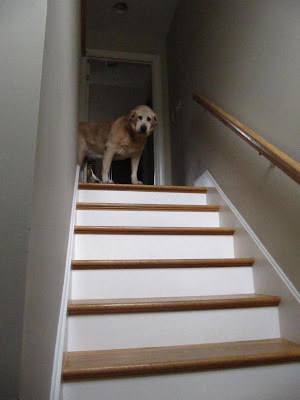 I have a 13 year old Golden retriever named Nala (you can see her in my last blog post), and she still makes it up and down the stairs on her own, but it is becoming harder and harder for her. I do worry that she may fall and I know we will end up carrying her up and down the stairs eventually, as there is no other way to go in and out of my house. Don't you hate to see them age..although they show amazing dignity and pride. Annie looks like such a sweet girl. 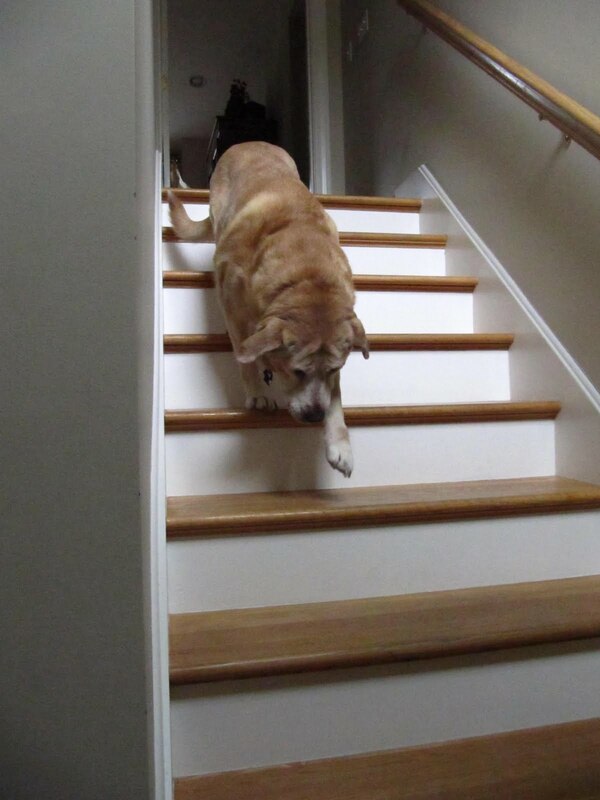 My heart goes out to her that she can't go up the stairs anymore, but it's definitely in her best interest. On a happier note, you are so creative! I am thoroughly impressed with your innovative ideas and your awesome tutorials! Definitely following. 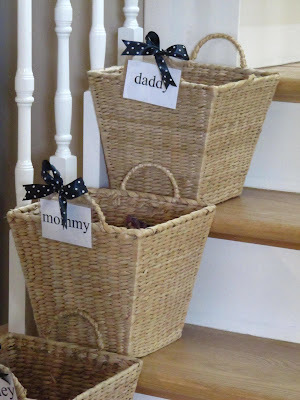 Great idea for the gate & the baskets for each person! Such a friendly girl you are! You have some lovely humans! Please tell your human mom that I love her crap baskets idea. I did notice that there wasn't a basket with YOUR name on it. Please be careful, Annie, you worry your humans when you aren't. Just found this via Pinterest. Our 11-year-old Corgi is getting a little stair-shy but fortunately we are moving to a place on the first floor. However our crazy little rescue Terrier does need to be corralled sometimes and this looks like a great way to achieve that! Love, love, love BOTH ideas! Annie is adorable. Love the basket idea. Where did you find them? Thanks. First -- came from pinterest! Second -- love, love both ideas. Sadly, I cannot incorporate the gate in our house...we have stair rails on one side and then a wall on the other. :( Which makes me sad...I would much rather have this than the baby gate we have now. But I WILL be making some crap baskets! I love this idea so, so much. And we always seem to have so much crap downstairs that needs to be upstairs!! Good Idea. However, our Lab couldn't do stairs if they were slippery. If they are not carpeted, they are slippery. Maybe some stair tread thingies (they are little rugs to fit) would let your dog be near you in her old age? I love this idea, a great way to keep Annie safe from falling. Will be using it to contain our 12 week old lab puppy. 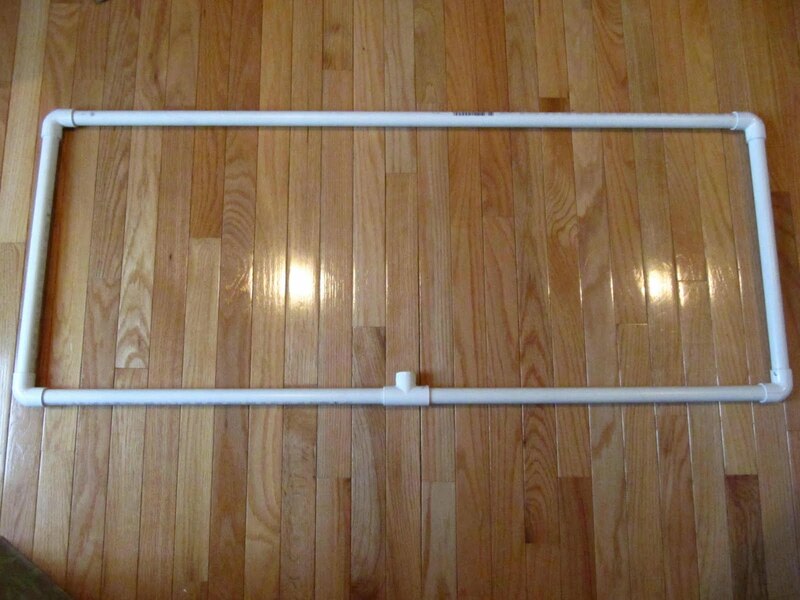 Very easy and much more attractive than any purchased baby gate I have seen. Thank you. Hugs to Annie! CUTE! That would be great for our Great Danes! 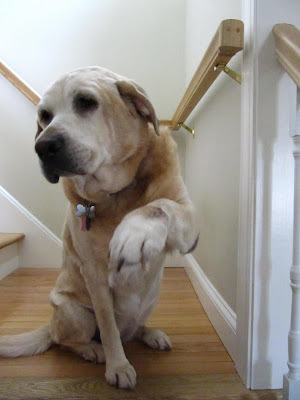 Seeing Annie gave me chills to see how much she looked like our golden retriever & lab mix! She was with us for 16 years and just recently passed... sad, but we have such great memories of her. I made this for my daughter. She has a stairway just like this. She has a 1 yr. old so needed to block the stairs. I did just like this but added a support in the middle. I made her a cover out of an old flat sheet and decorated it for the holidays and will make her one for everyday. Works perfect. Thanks! Just got my Crap Basket project underway. VERY excited!!! I want to do the crap basket project but cant find cute baskets. All the cute ones are sold as nesting ones and I want all the same size. Any suggestions? I saw this on pinterest and love the stair baskets - do you remember where you got them? They look like the perfect size! Such awesome ideas. I as well would be very interested to know where you purchased your baskets. They are perfect and i am not one that loves shopping so maybe they can be purchased on line. Thank you. Keep up the neat ideas. anyone have any ideas on how to use tis fabulous "gate" idea for a toddler?? my son would totally just take that and slide it right over, thru to the other side. it would need to be attached to the spindles some how. OH MY GOSH< I love love love both of these ideas!!!! Go u know where you got the baskets? Did you ever find the baskets for the stairs? Yes. 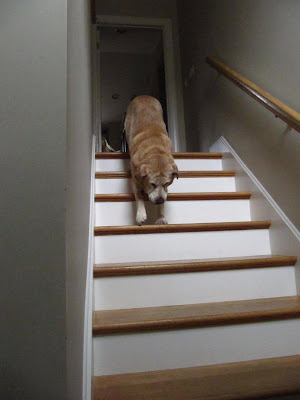 Our poor Cheerio is a yellow lab about the same age and is getting more and more reluctant to come upstairs at bedtime. I just know it hurts her poor hips. This is a great idea. But we will miss her sleeping in our room at night. Wish I had thought of this :( It is such a great idea! We had our 13yo kelpie euthanased around the time you wrote this post, Karen - he too, had severe arthritis and was unable to use the outside stairs for a long time. We had rigged up an old baby door-enclosure-thing but it was fixed in place, and too high for the kids to step over, so no-one used the stairs for months! I am going to make this today! We have two big decks, with stairs leading to the sidewalk/pavement, and whenever we go outside to play on the decks and swim in the kiddie pool, I am always afraid my son will fall down the stairs. Thanks for this great, easy, and cheap idea! I am sure that it will work for my needs!! I made this same gate for our dog! Clever minds think alike! We have a Jack Russell Terrier who could jump this gate but he has never tried! I like how the gate seems to disappear with the choice of fabric. What a wonderful idea, love Annie's hello by the way. I love the crap baskets!!!! 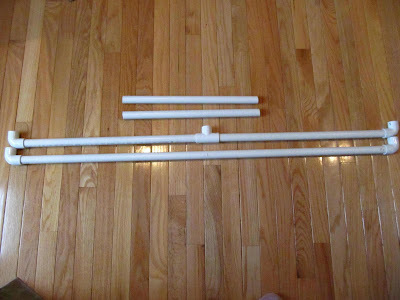 I will be making some of these - bf suggested we hang them on the railing so I think we'll put hooks on the spindles. Can't wait to get the 'crap' off the stairs!! Did anyone ever find those baskets?? I love the crap baskets! My sister is always complaining about her boys leaving things everywhere. This would work for her. Ha....this looks like a pretty old post...goes to show that it's still making it's rounds! Love the multi baskets for each family member. My girls are all grown and on their own so, I don't have a need for this anymore, but wish I had it way back when :( Your dog gate was the perfect fix...I hope you still have Annie! Where did u find ur baskets? I find this extra creepy, because they're using the photo of your house. We are getting a puppy soon. What a great idea! Also, love your "crap" baskets. I am constantly putting things on the stairs for my brood to take to the proper place! Absolutely love the single basket for each person idea. I have one stair basket and it is always a nightmare! I'm gonna go look at Walmart tomorrow for some new baskets! I think I'm gonna label mine with the electrical outlet covers that I saw you post before! 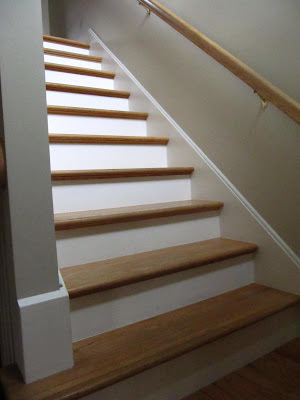 I did this same sort of thing when my grandchildren were litte, easier though.....I took a cheap piece of plywood, as tall as you would like and have it cut to fit a little longer than your stairs. You can cover it with fabric to match your decor or paint it with chalk board paint and the kiddos can draw on it. Just what I was looking for! The Dh and I were just at Lowes trying to pick a baby gate/doggy gate and they were either too ugly or too tall (he wants something he can step over). Thanks for this!! Oh and thanks to the comments/tips about using a tension rod! Thanks so much! My little 10 year old beagle has fallen down the steps twice also. But a baby gate just didn't work in the spot. I tweaked this by just adding fabric to an old bulletin board I had laying around. But I never would have thought of that without this! 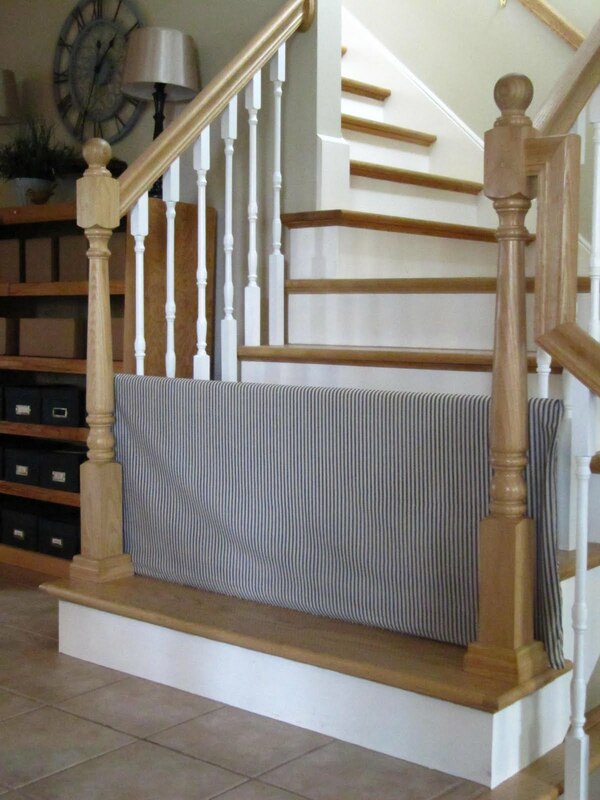 I love this idea, but I'm trying to think of how it would work with stairs that are open only on one end. In other words, there is only one side of our stairs that this could slide into. The other side is the wall. Any suggestions?? I just came across your post because I'm looking to maximize my space under my stairwell too. 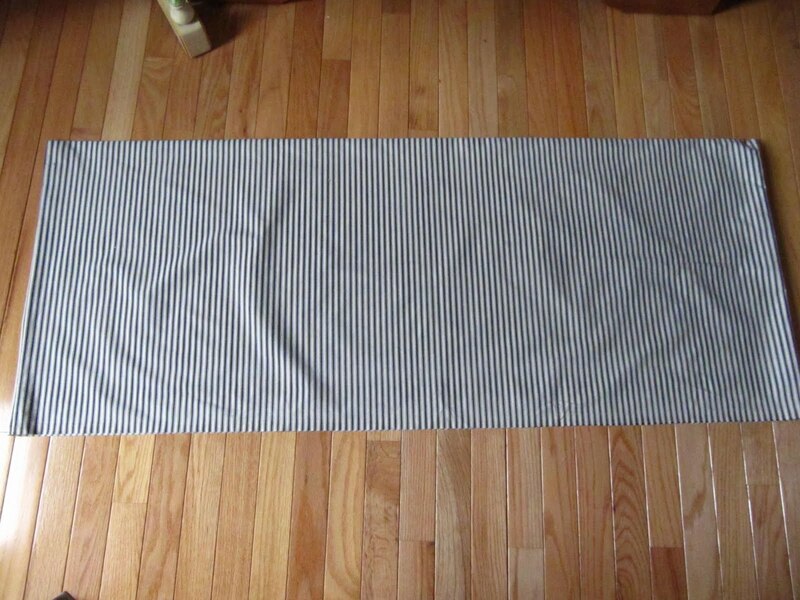 I cannot imagine not putting some type of rug/runner on my stairs. I am blown away. I sew too btw for my church!! Love your idea. I did something similar...we used crib railing from our son's old crib.